The UbuntuNet-Connect 2015 to be held in Maputo, Mozambique on 19-20 November this year is extra special to the UbuntuNet Alliance as it will coincide with the 10th anniversary of the Eastern and Southern Africa Research and Education Network. November 2015 will mark exactly 10 years since the UbuntuNet Alliance was formed at the World Summit on Information Society (WSIS) in Tunis, Tunisia in November 2005. UbuntuNet-Connect 2015 will therefore present the Alliance with an opportunity to celebrate the success it has registered over the ten years it has been operational as well as look into its future plans. The number 10 however seems to be a dominant digit for Alliance in this decade: Having started with just 5 established and emerging NRENs of MAREN (Malawi), TENET (South Africa), KENET (Kenya), MoRENet (Mozambique) and RwEdNet, the Alliance has, in 10 years, managed to bring on board additional 10 NREN Members, bringing the total NREN membership to 15. Between 2005 and 2015, NRENs from Burundi (BERNET), DRC (Eb@le), Ethiopia (EthERNet), Madagascar (iRENALA), Namibia (Xnet), Somalia (SomaliREN), Sudan (SudREN), Tanzania (TERNET), Uganda (RENU) and Zambia (ZAMREN) have joined and become paid up members of the Alliance. But of what use would having this significant number of NREN members be if the Alliance would not be meeting its objective of bringing affordable and high-speed Internet connectivity to them? Thanks to the European Union funded AfricaConnect project, the Alliance has managed to build the regional backbone network and install 8 Points of Presence (POPs) within the UbuntuNet Alliance region bringing the total number of the Alliance’s POPs to 10. 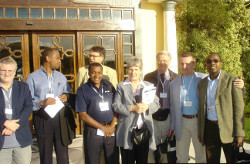 Before the AfricaConnect project, the Alliance had two POPs in London and Amsterdam that were delivering transit to NREN Members from Europe. On another front, the Alliance has managed to drastically reduce bandwidth costs for NRENs that are connected to the UbuntuNet network while increasing bandwidth capacity with notable NRENs like ZAMREN (Zambia) registering a bandwidth cost decrease from $900 per Mbps per month in 2012 to the current $256 per Mbps per month after getting connected to the UbuntuNet Network with the NREN’s bandwidth increasing from 155Mbps in 2012 to 1Gbps this year. In Uganda, institutions that are members of the National Research and Education Network (RENU) now pay $180 per Mbps per month down from the $540 per Mbps per month which they were paying before RENU connected to the UbuntuNet backbone in March 2014.